The fact that I'm a convicted felon is the first thing anyone learns about me when they Google me — it is my permanent Internet tattoo. So I don't hide it, I own it and try to turn it into a net positive to help others. I take every opportunity to speak on felon-related issues. Contact me if you're interested in having me speak or joining some panel. 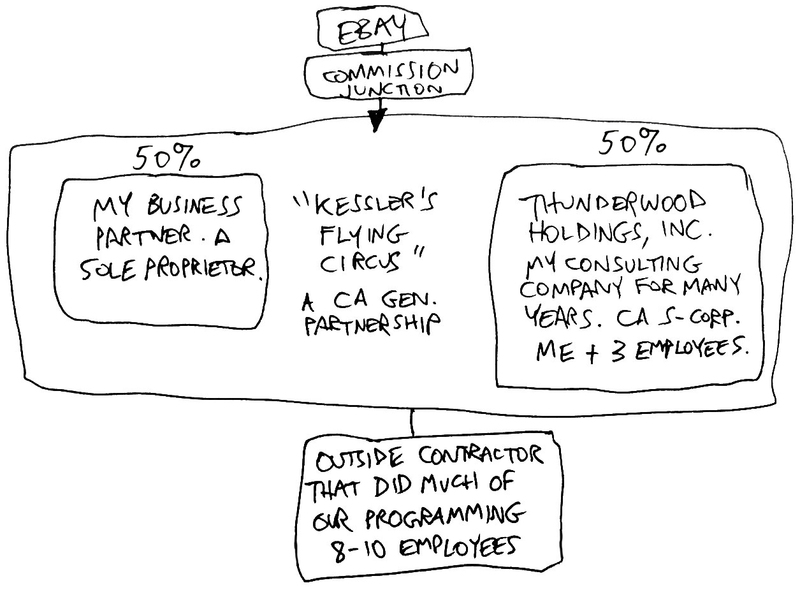 Until 2016, all blogs and articles about these cases (United States v Brian Dunning, eBay v Kessler's Flying Circus et. al.) have been based on press releases and document filings coming only from the prosecution. I was never able to tell my side of the story. I was compelled to plead guilty to violating 18 USC § 1343. That doesn't mean that much of the information published by attention-seeking bloggers or imaginative reporters was correct. I'd like to start by addressing the most malicious lie being spread by bloggers in an effort to harm the reputation of Skeptoid Media, the nonprofit I founded. It is often claimed that I am a "millionaire" who "begs for donations" via my podcast, Skeptoid. This is silly. In Skeptoid's early days (2006-2008), I did still have decent middle-class money in the bank; and was committed to the promotion of scientific skepticism. I funded projects like the Skeptoid podcast, The Skeptologists, Truth Hurts, and Here Be Dragons largely (or entirely) out of my own pocket. In fact, during those years, I stated clearly in the Skeptoid podcast that I did not accept donations. (Listen to the last 45 seconds or so of episode 67 from 2007 as one example.) Over the next year or so, having settled one gigantic civil lawsuit and having been in an ongoing fight against eBay's law firm O'Melveny & Myers for several years, we were not only broke, but in significant debt. My wife and I had to make a decision. Either I was going to have to quit the nonprofit and go back to consulting full time, or I was going to have to try and make a living from the profession I truly enjoyed. That was the point at which I began asking for donations from listeners who wanted to support the program ("beggars", on the other hand, offer nothing in return). The claim that I was a ever, at any point, a "millionaire begging for money" is absolutely false and malicious, and should not be condoned by any reasonable person. I have never owned, installed, or played World of Warcraft, nor did I ever play any sort of online game with this or any other defendant. Nothing remotely like this ever occurred. How this reporter came up with this is a complete mystery to me. I bring it up because it is exemplary of so many things about this case — misinformation (bizarre in some cases) is everywhere. Some of it can be explained by journalistic incompetence or laziness. In an earlier article, this same reporter also said that my brother had been indicted. Apparently he made this up out of whole cloth, as no such thing ever happened or was even reported anywhere else to have happened. Don't be so quick to trust hastily written news articles, no matter how much you may trust the publisher. The basic premise of this Yahoo! Finance article was that eBay worked with the FBI for an entire year, collecting evidence and building a case. This is completely false; eBay's Powerpoint presentation, with which they initially contacted the FBI, is dated June 2007, just two weeks before the raids. In a private email, the reporter told me that he made this assumption based on a single typo in one of the public court filings giving the FBI interview date of one eBay employee as June 2006 instead of June 2007. There was no "year of investigation" — eBay spent that year tracking user behavior by writing cookies through as many ads as they could, and actively compelling the affiliates to facilitate it for them. It's very important to understand what an FBI 302 document is. By written policy, the FBI never records (or allows to be recorded) any interviews. They take handwritten notes only, which are later interpreted and written into a narrative, called a 302. This narrative then becomes the official legal account of what you said. You cannot challenge what's in a 302; if you do, you're either lying now, or you lied to the FBI. For some well-deserved criticism of this process, check these articles — Boston Globe, Tech Dirt, Forbes. Or Google for your own. It's actually a bit scary. When I was raided on June 18, 2007, I was interrogated by the FBI in a corner room of my house with armed guards. I was not mirandized. Several times I requested a lawyer; the requests were answered only with more questions — which I naively answered (1) because I was terrified, and (2) because I believed I was assisting the legal process of getting to the root of what I thought was some huge misunderstanding. This 3.5-hour interview resulted in a 302 document that, when I saw it, I could hardly believe how full of errors it was, and how it had twisted virtually everything I'd said into arrogant boasting of my Master Criminal skills. I told them I had been the technical editor for FileMaker Pro Advisor magazine for many years, since defunct; the 302 recorded this as "I was writing an article I hoped to have published." At one point my partner and I made a whistle-blowing phone call to eBay about another affiliate, upon which they never acted. Bizarrely, the 302 added (apparently invented out of thin air) "DUNNING made [business partner] call back several months later and retract his statements feeling it was not their place to rat out a friend." No such retraction was ever discussed or made. These seem trivial, but reflect the general accuracy of the entire document throughout. Note how serious this became when the questions got down to the specifics of our affiliate marketing program. He believes the Affiliate Program is "stupid and illogical and unnecessary" . He believes the two of them deserve kudos for finding a "clever" method for taking advantage of a "stupid program". Q: We found files on your computer showing that you went to a website with instructions on how to make a bomb, so we know you did it. When did you first go to the bomb website? A: I surf the web constantly and go through, like, a million pages. I have no idea what pages I searched or when. How could I possibly know? Notated in 302: D cannot recall when he first went to bomb website. Went "constantly." It has also been argued that I "stole millions" or that the actual amount obtained fraudulently by our company was much larger than the $200-400K claimed by eBay. (There is an exact number that fell inside that range; and for some legal purpose not fully understood by me, only the range is what was in the court documents, so it's what I'm giving here.) It is true that our company's gross sales from 2005-2007 from eBay US were $5.3 million dollars, but the margins are not as fat as you might expect. We were paying for a lot of ad placement. There were about 15 total people in our organization. There was the same amount of overhead as any other business. One public document reported that I was personally paid $1.2 million over that time period, before taxes; so, in other words, I'd earned less than every lawyer I was ever seated at a table with. Here is how you can be assured that the vast majority, the over 90% of our earnings that neither eBay nor the prosecution ever disputed, was legitimately earned. This is a chart from eBay's June 2007 Powerpoint presentation, showing the total payouts of their affiliate marketing program over our final year. They refused to produce the data from which this chart was generated, but you can still see one clear trend: While the earnings of the #1 affiliate who was displaying transparent pixels only, instead of the ads he was being paid to display (orange in the graph), had relatively flat earnings of about $1 million per month; our group ("Kessler", yellow in the graph) showed a curve of ups and downs that closely matched the affiliate program overall (blue). This is because (while we did indeed include eBay's pixel through which they wrote cookies) we were displaying good ads with good placement, as they were paying us to do, and were indeed generating clicks and serious profits for eBay. Anyone who has been in business and sees these numbers, and understands what overhead and taxes and cost of living are, knows that it's absurd to expect any one person in this chart to end up with millions of dollars in his possession. Perhaps the most ridiculous of the misinformation has been the conspiracy theory that my multiple-award-winning podcast Skeptoid, to which I've devoted the last 8 years of my life, secretly existed only to implant eBay cookies on listener's computers. This is both technically and temporally nonsensical (and is, of course, absolutely false). It's also been alleged that Skeptoid Media, Inc. (a 501c3 public charity) was set up as a nonprofit to shield my "stolen millions". Again, temporally impossible (by a span of 5 years) and provably false (also impossible because stolen money cannot be shielded from the feds; they can seize anything from anyone at any time, no exceptions). A word of warning to bloggers that both of these are actionable claims. You are free to consult with Skeptoid's board of directors if you have any doubts. Regarding sensational headlines, just use your head to parse them. "Cookie stuffing affiliates steal 5 million dollars and face 20 years in prison" is wrong, and it's based on three unrelated true facts that were misintepreted exactly how the US Attorney's press office hoped you would. 5 million dollars was earned. True. They just didn't happen to mention that eBay claimed only 5-8% of it was fraudulent. They hoped you'd wrongly assume that all of it was. "Cookie stuffing" was employed. True, as we've been explaining since day 1. The maximum penalty for wire fraud is 20 years. True, but sentences are based on a complicated point system, and something of this small scope was never remotely in that neighborhood. Long sentences or giant fines were never on my horizon. It was about 2 years max, had I done the things I was accused of. Anyway, this is about all I have time to write for now. I welcome questions and comments. Just want to help you separate what's true from what's not.